Kitchen opening onto decking. Ceramic hob. Large refrigerator/ deep-freeze. High diner table with 6 high stools. Bathroom with shower 90x100. Washing machine. The perfect accommodation for those who make space a priority! Ultra-spacious bedroom with double bed (160 X 200) and a dressing room. Spacious living room with dining area. Kitchen with bar. MOBILE- HOME LIFE - Specially designed for disabled people. 1 bedroom with one bed (90*190) and a bunk transverse (70*190). Living/Dining area with convertible sofa bed (130*190 cm). Equipped ergonomic kitchen, micro-wave, refrigerator/freezer, hood. Accessible shower bathroom with adapted shower and WC, hairdryer, shower seat and grab bars. Heating, Large decking with access ramp for wheelchair, 2 sun-loungers, parasol, gas barbecue. 2 bathrooms (including one 'en-suite'), 2 wc. Large refrigerator/deep freeze, micro-wave/grill. Large terrace with pergola. Retractable bed in one of twin bedrooms : more space if used by only 1 person or space for baby cot. Les Fragonnettes is a 100m2, 5 bedrooms, two-storey house. Simply furnished, it is located in the former farm village located just next to the Castel Camping La Garangeoire. Fully equipped kitchen with dishwasher, refrigerator/deep freeze, oven, stove... Laundry-room with washing machine and iron. 2 bathrooms (1 per floor) with bath. 2 separate toilets (ground floor only). Living/dining room. A high chair and a baby cot included. Extra large and private garden, with outside furniture and gas barbecue. Please note that the 5-star classification obtained by Castel Camping La Garangeoire does not include the gite accommodation. Large pitches from 125 up to 165 m2, with electricity 16 amps, these pitches allow campers with tents to travel light! These pitches are quiet and luxuriant setting, with equipment and services included in the rate. Warning: the tent is not provided! 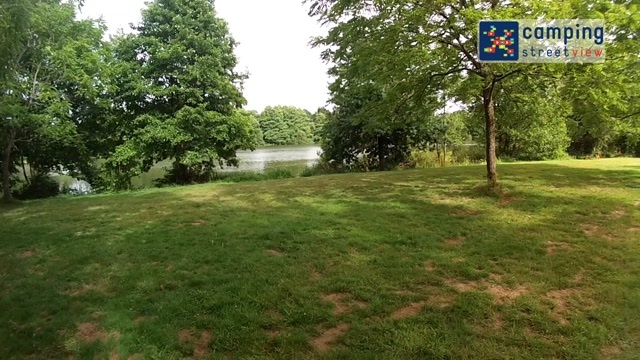 Ground floor of an ancient farmhouse converted into a simply furnished holiday home, la Dodinière is located in the former Garangeoire farm village, just next to the campsite. 3 bedrooms. Living-room with sofa bed. Equipped kitchen with dishwasher and electric oven. 1 bathroom with bath. Separate WC. Laundry room with shower and washing machine. Large garden with outside furniture and gas barbecue. Please note that : Evening entertainment is regularly organised in the nearby animation area; the 5-star classification obtained by Castel camping la Garangeoire equipment & services does not include the gite accommodation. Wide living-room, opening on a large covered terrace. Spacious parents'room (space for baby cot). Retractable bed in one of twin bedrooms : more space if used by only 1 person or space for baby cot. Electric oven – Large refrigerator/ deep-freeze. Large privileged pitches from 180 up to 260 m2, with electricity 16 amps, water and drainage. These pitches are quiet and luxuriant setting, with equipment and services included in the rate. Shaded pitch with a surface of 150 m², bounded by hedges. They are suitable for « tranditional » campers with tents. Ranging from 125 to 200 m², pitches are marked out and individually named. You will have a choice of situation either in the shade of oak trees, or in the meadow, sheltered by a hedge or unshaded. Characteristic for these large 3 bed-model is the space, and the freedom of movement. A lot of attention has been paid to ergonomics and to promote coziness. 2 Bedrooms with twin beds (No bunk beds). Large living area with dining area separated from sitting area. Kitchen with bar. Dish-washer, CD player Hi-fi, large refrigerator/deep freeze. Compact accomodation with excellent quality/price ratio for 4 persons. 1 Bedroom with double bed (140 X 190). Accommodation equipped with TV, covered terrace. Superior insulation. 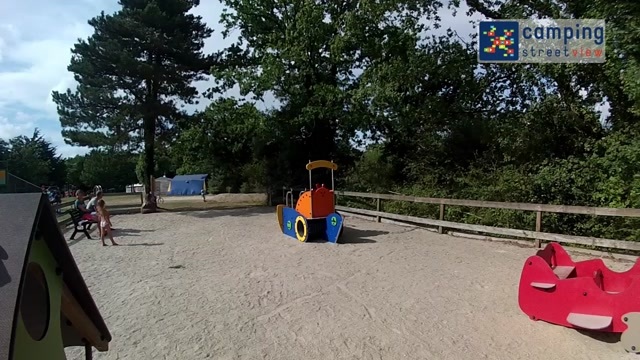 Located near services and play areas. 1 bedroom with double bed (140*190 cm). 1 bedroom with twin beds (80*190 cm). Convertible sofa in the living-room. Dining corner with equipped kitchen, micro-wave, refrigerator. Heating. Outside furniture, gas barbecue. This model offers space, comfort and ergonomics. Its large living area encourages conviviality. Large bedroom with double bed (160 X 200) and the possibility to accommodate a cot, with direct access to bathroom. Living room very spacious and dining area, ideal for meals with family or friends. Kitchen with bar. Model 2011 with semi-covered decking, model 2015 & 2016 with covered decking. 1 Bedroom with double bed, 1 bedroom with twin beds and 1 bedroom with bunk beds. Living/dining area and kitchen opening onto decking. More comfort, without loosing the feeling of camping! Pitch with a surface of 145 up to 160 m², with electricity 16 amps, water and drainage. The private sanitary unit contains: WC, shower, sink. Dishwashing sink and 45 litres refrigerator on the decking. Exclusive model for La Garangeoire with Two-tone painted wood cladding and partially covered decking. - 2 bedrooms with twin trundle beds 70x190 cm. Built of wood and canvas on a shaded pitch, raised on stilts, the bivouac tent can accommodate 1 or 2 people. Inside there is a mattress of 140x190cm. With its shaded picnic table and benches. 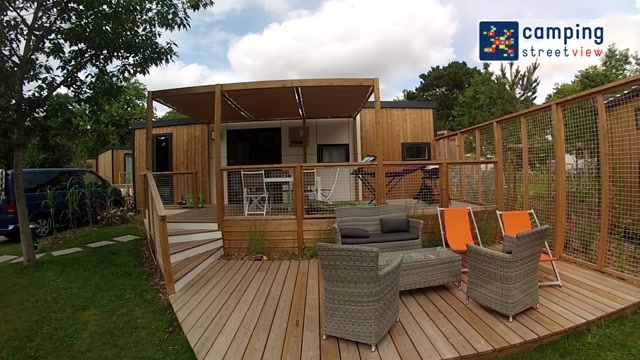 This accommodation is perfect for enjoying your camping, without having to erect your tent. Ideal for additional sleeping accommodation for larger families, or for bicycle tourists. Ancient barn converted into a holiday home, La Grange des Fragons is located in the former Garangeoire farm village, just next to the Castel Campsite La Garangeoire. No blinds for the roofwindows in the bedrooms, no curtains for the patio doors. Equipped with a Piano Yamaha Clavinova. A FUN and COSY alternative, between tent and mobile-home. Small kitchen with table top refrigerator, electric plates, microwave, electric kettle, kitchenware. Bedroom with a double bed 140x190cm. Living area with 2 sofa-beds. Large canopy terrace with a lockable front door. Model without sink or sanitary but nearby a shower block; water tap on the pitch. A small additional tent can be pitched (not provided). Accommodation with Premium services (beds already made on arrival, supply of towels, bathmats and tea towels; safe; play tent for children; baby cot and high chair upon request). Large double decking with retractable sun canopy, outdoor furniture, gas barbecue and LED lighting. 2 bathrooms. En suite bedroom with dressing, double bed 160x200cm, large shower. Second bedroom with 80x190cm trundle beds, and direct access to bathroom. Living room with dining table, coffee table and confortable sofa. Equipped kitchen with electric oven, dishwasher, 3-zone induction hob and large refrigerator with deep freeze. Privileged area, facing south. Large double decking with retractable sun canopy, outdoor furniture, gas barbecue and LED lighting. 2 bathrooms. Second bedroom with 80x190cm trundle beds, third bedroom with 2 bunk beds 80x190cm and large windows; both bedrooms with direct access to bathroom. Unshaded pitch with a surface of 110 m², with electricity 16 amps. Close to the shower block. Part hard-standing gravel (1/3), part grass (2/3). Choose a top of the range wooden accommodation that offers a stylish look together with space and comfort. The net of the decking, the warm Led lighting, the furniture in limed reclaimed wood, give La Grande Cabane a welcome atmosphere and a unique charm. 1 Bedroom with double bed 160 x 200 cm. 1 Bedroom with twin beds 80 X 200 cm. Large living area with convertible sofa, electric heater. No TV. Kitchen equipped with refrigerator/freezer, ceramic 2 hobs, micro-wave, crockery and cutlery for 5 persons. Bathroom with walk-in shower (80 X 100 cm), hair-dryer. Separate WC. Location at the entrance of the campsite, close to reception, services and Wifi zone. South / South-West orientation. 2 sunbeds, parasol. We advise against the choice of La Grande Cabane for families with young children and are at your disposal to recommend more suitable accommodation. Great campsite, great facilities - cant wait to go back ! A very enjoyable return visit after a long break. A lot more relaxing than when we had three boisterous children in tow! Many changes, all for the better in our opinion. This was our first time in a mobile home. We did find it a little cramped, but the lovely weather meant we spent most of the time outside anyway! Very clean, modern and well equipped. Friendly staff, great accommodation, enjoyed the evening entertainment, good food at the bar and takeway (didn't eat in restaurant this year). relaxing, friendly, good for families, quiet, mixture of onsite activities and offsite activities. generous sized pitches. bushes between pitches provide privacy. 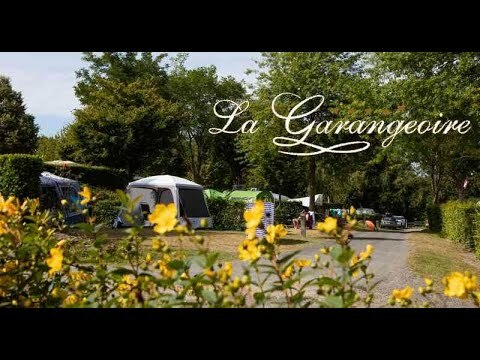 La Garangeoire is our favourite campsite in the summer. The range of facilities is great. The staff are always friendly and helpful and go out of their way to make you feel at home and help with anything at all. This year we were on Zebres and loved the fact that it was in a quiet and secluded spot and the hedging around it made it feel like we were all alone. The pitches we have had in the past have also been great and we like the size of them as you can fit the tent, car and have a play area left for kids. It's also great that the toilet blocks are always within an easy distance no matter which pitch you are on. Very friendly, helpful staff. Accommodation clean and well looked after. Helpful and friendly staff. We loved the space around the site for walks. Beautiful setting. Loved having a fully serviced pitch. Huge pitch, off the beaten track but still walking distance to the big wash blocks. We stayed on the ptch called 'Parulines' it was perfect. Possible more for the older children between 11-15. Slightly overpriced in the food shop but to be expected on site (there is a local shop Lidl within 5 mins drive). Everything! Very clean, helpful, beautiful settings, close to lots to do, extremely large pitches, fair price on activities. Overall this place is a gem and one we will always suggest and return to!